At the 2017 FIRST World Championship in St. Louis, nearly 700 teams (15,000 students) from 33 countries competed in the four FIRST programs. This is the first year of two world championships, one in Houston and one in St. Louis, taking place on consecutive weekends. Next year the northern World Championship will move from St. Louis to Detroit, so experiencing our last championship in St. Louis was bittersweet! 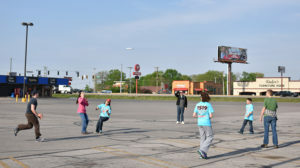 A Frisbee break during the long coach bus trip to St. Louis. On Tuesday, April 25, twenty-five Mechanical Mayhem students, mentors, and family members boarded a coach bus in Nashua, NH. Of these twenty-five people, five were also participating with the NH Champion FIRST LEGO League (FLL) team Wisdom Hunters which was mentored by MAYHEM team members and qualified for the World Championship by winning the top award at the 2016 FLL NH State Tournament in December. After a short drive to Ayer, MA, our coach bus picked up our friends Andromeda One (FRC #4905) with whom we traveled to St. Louis in 2014 and 2016 as well. Five additional MAYHEM parents and mentors met us in St. Louis, after traveling by plane or car. When the coach bus arrived in St. Louis on Wednesday, team members headed in several directions to maximize the fun and productivity. While the pit crew loaded in all the pit materials and uncrated the robot, another group enjoyed the ride up the Gateway Arch. 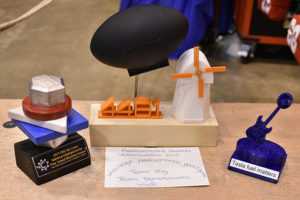 Some folks also visited the Innovation Faire or attended some FIRST Robotics Conference talks. 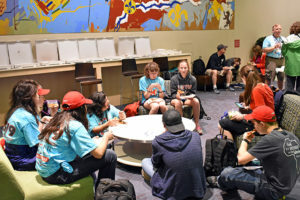 Over several days students and chaperones attended talks on the following topics: women in STEM, training student leaders, artificial intelligence, scouting, and sensors. Pizza dinner at America’s Center on Wednesday night (the first of many meals supplied by Altium)! 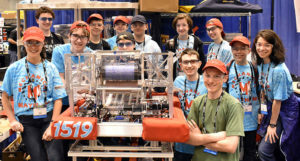 On Thursday, the official FRC matches on all six division fields began. We competed in the Tesla division with 67 other teams from across the northern US, Canada, and Netherlands. When qualification matches finished, we ranked 9th in our division. Amazingly, of the 114 qualification matches in the Tesla Division, only two matches had an alliance which achieved the maximum of four ranking points in the match, and our team was on the winning alliance in both of those matches! Congratulations to senior Sean Moushegian who won Mentor of the Year at the FLL World Festival for mentoring the Wisdom Hunters FLL team and assisting many other FIRST teams! Our four seniors (Sean, Andy, Will & Nick) will be greatly missed! All four are making us proud by planning to continue their education in STEM at college! Representatives from the Rockwell Automation sponsored teams at Championship. Thanks, Rockwell Automation!